Hundreds of fast food and retail workers are expected to join the work stoppage, making Milwaukee the fifth city in the strike wave. Two updates, including the filing of Unfair Labor Practice charges yesterday against companies, appear below. Hundreds of Milwaukee workers plan to walk off the job starting at 6 Central Time this morning, launching the nation’s fifth fast food workers’ strike in six weeks. Today’s work stoppage follows strikes in St. Louis and Detroit last week, and in New York and Chicago last month. In each case, workers are demanding a raise to $15 per hour, and the right to form a union without intimidation. As I’ve reported, these recent work stoppages share several common characteristics: Each is a one-day strike by fast food workers, backed by a coalition of unions and community groups, targeting major companies throughout the industry and mobilizing a minority of the workforce in hopes of building broader support. While different local organizations have been involved in each city’s actions, the Service Employees International Union has played a significant role in all of them. The campaign expects today’s strikes to involve workers from fast food chains including McDonald’s, Burger King and Taco Bell. Like Chicago’s, the Milwaukee strike involves retail as well as fast food: workers from companies including TJ Maxx, Dollar Tree and Footaction plan to strike. Both industries are increasingly prevalent in—and representative of—the US economy, and both are overwhelmingly non-union. Reached for comment during last Friday’s strike in Detroit, a McDonald’s spokesperson sent a statement touting “competitive wages” “access to flexible schedules and quality, affordable benefits” and “training and professional development opportunities” for McDonald’s workers. “We value and respect all the employees who work at McDonald’s restaurants,” said the statement. The company did not respond to a follow-up inquiry regarding the strikers’ demands, or whether they could face punishment for walking off the job. The spread of the fast food strikes, and of strikes by non-union workers in the Walmart supply chain, comes amid a multi-decade decline in US strikes, fueled in part by legal and economic changes that have made them more risky and less effective. According to the campaigns, recent fast food strikers have so far generally not been punished for it, a result that some activists chalk up to community pressure and media scrutiny rather than to legal protection. Sanders said that, while she initially worried that management would retaliate against her if she struck, organizers “told me that we have the legal right to at least take one day” over their grievances. How great is the risk? Under US law, it’s generally illegal to “fire” workers for going on strike, but legal to “permanently replace” them—effectively terminating them by refusing to let them come back to work following the strike. 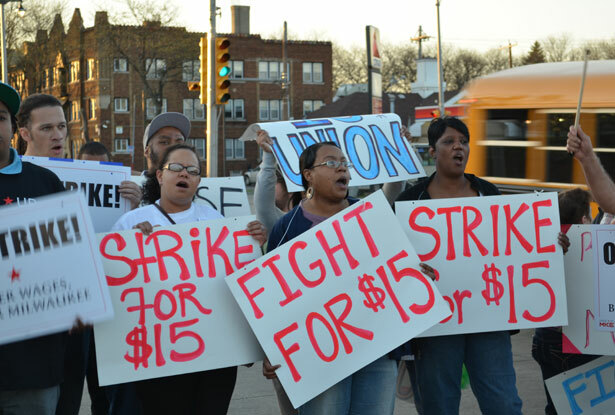 Prior to striking, fast food workers in other cities have filed “Unfair Labor Practice” charges with the National Labor Relations Board, alleging law-breaking by management, which potentially protects them from being “permanently replaced.” Epps-Addison said last night that such charges so far had not been filed in Milwaukee (see update below). But the one-day duration of the strikes does reduce the risk: Interviewed last October, former NLRB Chair Wilma Liebman said that a company generally would not have legal grounds to “permanently replace” strikers who had already pledged to return to work the next day. When a New York City Wendy’s worker was initially denied the chance to return to work following the first of the fast food strikes, rather than filing charges with the government, local, political and religious leaders occupied and picketed the store until management relented and returned her to work. Epps-Addison said that she and other Milwaukee activists are similarly ready to take direct action if any companies crack down on strikers: “I’ve committed myself to going to that store, and sitting down in that store, and refusing to leave until the workers are protected.” Sanders predicted that McDonald’s would not retaliate, because “I don’t think they want the repercussions of what may happen” if they did. Update (9:50 am EST Wednesday): In a follow-up message Wednesday morning, the campaign told The Nation that a slew of Unfair Labor Practice charges were filed with the National Labor Relations Board yesterday alleging violations of labor law by management. Update (1 pm EST Wednesday): According to the campaign, close to 200 workers are expected to strike by the end of today. Strikers and supporters will converge for a rally at 5 pm Central Time this evening. Burger King declined a request for comment on today’s strike. McDonald’s, Taco Bell, TJ Maxx, Dollar Tree, and Footaction did not immediately respond to inquiries this morning. This month, Occupy Wall Street offshoots have experienced a cross-country resurgence. Read Allison Kilkenny’s report.